...the cheap part is not the reason to eat at these establishments, it’s the food. Thai's take great pride in their food preparation and service; it’s a big part of the culture here, intertwined in everyday life. From fine dining, to fusion blends, to noodle stands, you should try them all. Of course you are going to enjoy authentic Thai cuisine in the many lovely restaurants in Koh Samui, but you won’t see many locals eating in these places. Where you will notice many Thai’s eating on Koh Samui is the Thai street food noodle stalls, the roadside bamboo huts and small restaurants with open kitchens in true authentic Thai style. This is how the Thai’s cook and this is how most of them eat. Some visitors may be put off by the décor, the design, the fact it’s a few tables set up on the side of the road next to a mobile food cart or the restaurant is small and just an extension of a house. Do not let this put you off, competition is high on Koh Samui, if the food was no good, they’d be out of business in a day. If you see Thai’s eating there then you know the food is good. One of our favourite Thai roadside eateries is in Bang Rak; Khao Hom Restaurant. We have eaten there many times and not seen one foreigner there yet, but many Thai's do. It is one of the most authentic Thai food experiences on Koh Samui, we highly recommend it and hope when visiting Samui you make a point of trying it out. 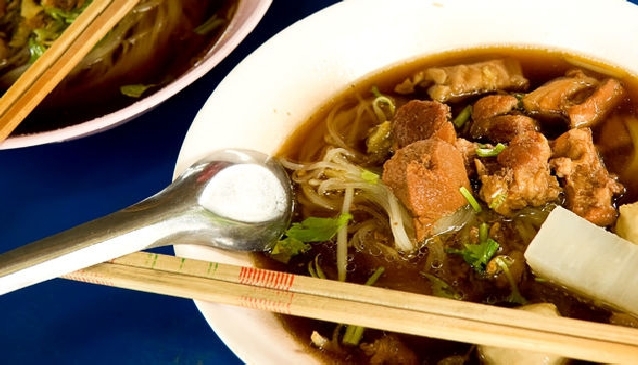 What you can expect from Thai street food is basic classic Thai cuisine; noodle soups, Thai salads and various dishes with meats, blended with a variety of herbs and vegetables. All the ingredients are bought fresh on the day from local markets and each dish is made to order. The standard of service is just as good as you’ll find in what some may consider higher-class restaurants, you are always greeted with the familiar Thai smile and are warmly welcomed. Not only is the service friendly, the food service is usually super fast. What you need to be aware of is how spicy you would like your meal. Southern Thai food in particular is spicy, if you ask for spicy you might get tourist spicy or you may get full-blown Southern Thai spice. If you are not into spicy, it’s best to ask for little or no spice as you are able to add your desired spice level from the table condiments provided. Also the same meal will vary from place to place, and even if you return to the same place for the same meal it may have a slightly different flavour or taste, as is the Thai style of cooking. The bonus at the end of your meal is when you receive the bill. For a single meal with light drink, prices vary from 50 Baht to 150 Baht; you wouldn’t expect to pay much more. However, the cheap part is not the reason to eat at these establishments, it’s the food. Many of the locals you see eating here could afford to eat in any fine dining restaurant on the island, they’re not eating there to save money, they are eating because the food is good! We hope you get out there and try some of the places we have tried and have listed in our Thai Roadside Eateries category!